The Cultural Alliance of Fairfield County is a nonprofit service organization that supports its members through unified marketing, capacity building, professional development, and advocacy services. This newsletter is sent to all who request it - but we ask that, if you are not a member, you explore membership benefits and consider joining this community of more than 600 individuals and organizations. You can sign up here. Sign up now for an evening of Portuguese cuisine and seafood Tues. Aug. 7, 6-9pm at Dolphin's Cove Restaurant and Marina, as the next in the series of SavorCity visits to the culinary hidden gems of the most diverse city in CT. The Matias family have been serving seafood and Portuguese favorites since 1993 at their spot on Bridgeport's East End shoreline. Adding to the magic of seafood on the deck will be the amazing large 3-D sculptures by Iyaba Ibo Mandingo from his AFRIKA 360 series. Musical performance by Jen Durkin & The Business. Keep your eyes peeled for the announcement of the return of The Progressive Gallery Tour: starting this September in Greenwich with at least four of our member commercial galleries. ArtistsTalk is a series of video-recorded short talks by artist members of the Cultural Alliance of Fairfield County about their work in select group and juried shows is available on our YouTube channel – an asset for our artists and a showcase for the richness of the visual arts in the County. Look for this series to continue in the Fall. Igor Pikayzen is award-winning Russian-American violinist who is proving to be one of the most prodigious and in-demand soloists of his generation. Since his concerto debut at the age of 8, with Mozart's Violin Concerto #2 and the Moscow Philharmonic Orchestra, Pikayzen has appeared as a soloist with major orchestras spanning Europe, Asia, North and South America. In the last two seasons alone, he has given debuts and returned to Carnegie Hall and Alice Tully Hall in New York City, Tchaikovsky Hall and Minor Hall in Moscow, and Cadogan Hall in London, to name just a few. He is also a frequent guest at some of the most prestigious chamber music festivals and series in the world. His extensive discography demonstrates his versatility as an artist, and includes his debut album, with virtuoso works of Saint-Saëns, Ysaÿe, Paganini, and Wieniawski on the ProArte label. He is the first-prize winner at the Vina del Mar, Wronski, Szeryng and numerous other international violin competitions. Grandson of the legendary Soviet violinist Viktor Pikayzen, Igor was born in Moscow, Russia. After receiving his Bachelor's Degree from Juilliard, as well as a Master's Degree and Artist Diploma from the Yale School of Music, he is currently completing his DMA at the CUNY Graduate Center and is on the violin faculty of Brooklyn Conservatory. He shares his time between New York and Westport, where he has launched an annual summer music festival, Edelio. See Igor's website here. Lizzy Rockwell is an illustrator of over 25 picture books, five of which she also wrote. 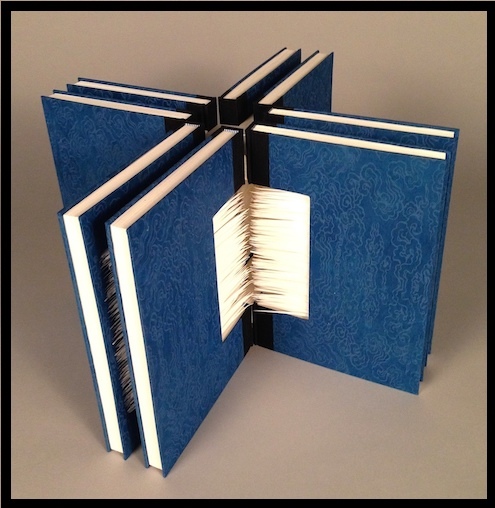 Her artwork can be seen in picture books, magazines, games and on walls. She studied art and art history at Connecticut College, and drawing and illustration at the School of Visual Arts in New York City. She is the author/illustrator of Plants Feed Me, Good Enough to Eat: A Kid's Guide to Food and Nutrition, Hello Baby! and The Busy Body Book: A Kid's Guide to Fitness. Lizzy has two grown sons, and lives and works in Bridgeport, CT with her husband, Ken Alcorn, a high school social studies teacher, and their dog Reggie. In 2010, Lizzy completed a 28-foot long mural for the Pediatric waiting room at the Norwalk Community Health Center in Norwalk, about which she said: "The image models elements essential to the health of a child: safe and beautiful outdoor public places, exercise, fresh air and clean water, healthy food, creativity, books, relaxation, and caring." Lizzy is also the artistic director ofPeace by Piece: The Norwalk Community Quilt Project. She is a frequent presenter at schools and libraries. See Lizzy Rockwell's website here. 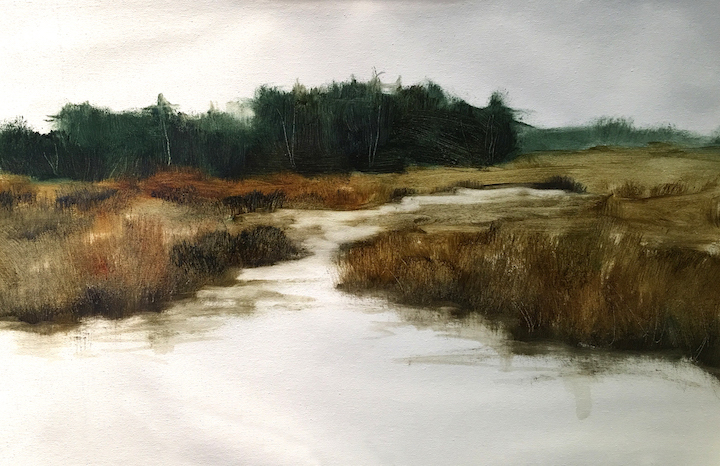 Paul R. Berger, Heidi Lewis Coleman, Dawn Dahl, Carol Nipomnich Dixon, Judy Peknik and Julia-Rose were all juried into the Far Away Places exhibition, curated by Dennis Bradbury, and opening with a reception at the Stamford Art Association at its Townhouse Gallery, Fri., July 27 6-8 pm. Jahmane Artz, Ann Chernow, Alicia Cobb, Penny Cook, Rod Cook, Lauren Sugacane Danger, Joe Dermody, Erin Dolan, Heide Follin, Christa Forrest, Brec Morgan, Aisha Nailah, Lizzy Rockwell, Liz Squillace, Karen Vogel, Gregg Welz and Nancy Woodward are among the 40+ artists who have donated their works to the ART FOREVER exhibition silent auction fundraiser for 22 Haviland Street Gallery on its 15th birthday, Fri. Aug. 3, 5-9pm, in South Norwalk, at 22 Haviland Street during the SoNo Arts Festival weekend in the neighborhood. Bidding stops Sunday, Aug. 5, at 5pm - the gallery is open S/S Aug. 4-5, noon-5pm. Ann Chernow has several pieces, including My Blue Heaven (lithograph, 17x19, detail at right, click for complete image), in The Art of the Print at The White Gallery (342 Main Street, Lakeville, CT) running through Sept. 9. 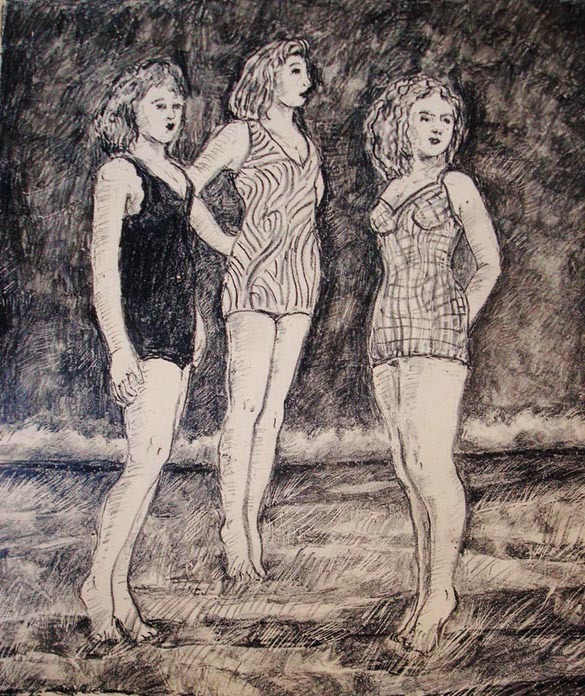 Ann also has donated Jim’s Girls (2018, lithograph from one stone, edition of 7) to the ART FOREVER exhibition and silent auction, at 22 Haviland Street Gallery, opening Fri. Aug 3, 5-9pm. Lauren "Sugacane Danger" Clayton has donated one piece to the ART FOREVER exhibition and silent auction, at 22 Haviland Street Gallery, opening Fri. Aug 3, 5-9pm. 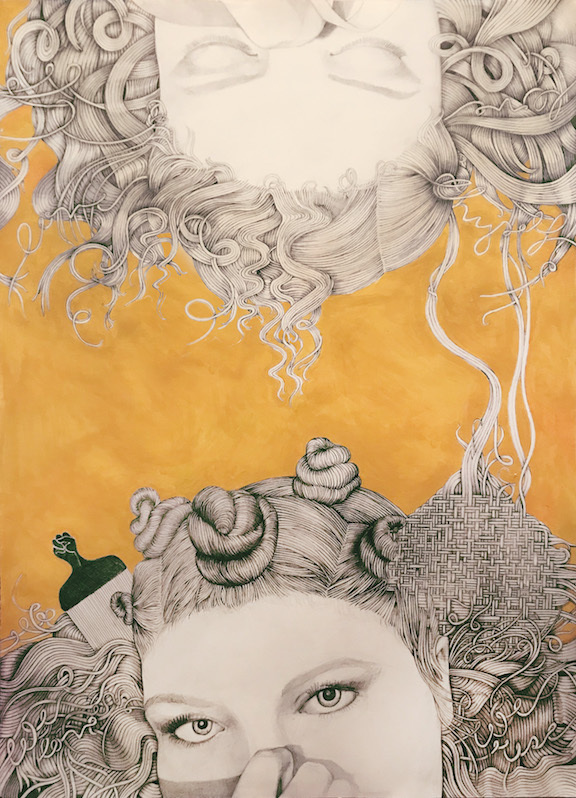 At right, a detail from her Rise Above (2018, pencil and acrylic on paper, 36 x 24, click for complete image). The work, Lauren says, explores the idea of self-love and self-care. "To love oneself means to rise above your fears, personal constraints and embrace your uniqueness, beauty and inner voice. Woven and entangled in her hair, words of encouragement can be found like, 'love thyself.'" Heidi Lewis Coleman is currently featured in BostonVoyager Magazine, produced by a media company whose mission is "to build a platform that fosters collaboration and support for small businesses, independent artists and entrepreneurs, local institutions and those that make a city interesting." Heidi's interview includes a discussion of her creative practices, as well as the sources of inspiration that she uses when creating her artwork. Check it out here. Eugenie Diserio's Crystal Matrix paintings on paper are featured in The Quote New York, the recently launched online marketplace of 10011Mag focusing on emerging artists and discerning collectors. At right, detail of Resonance, (2018, acrylic, glitter on paper, 11 x 14), one of five pieces shown. The paintings in the crystal matrix series use metallics and glitter to embody a surface of iridescent light. Eugenie comments that historically and today, reflections connect human beings with the spirit world and life’s deeper mysteries. 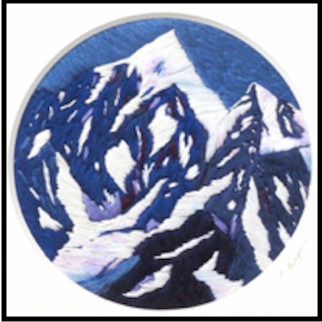 Carol Nipomnich Dixon had her Over the Alps (2016, embroidery with Caran d'Ache on felt, 13" square) juried into the Far Away Places exhibition, curated by Dennis Bradbury, and opening with a reception at the Stamford Art Association at its Townhouse Gallery, Fri., July 27 6-8 pm. Inspired by a view of the snow-covered Alps from an airplane on a trip to Europe that Carol took a couple of years ago. 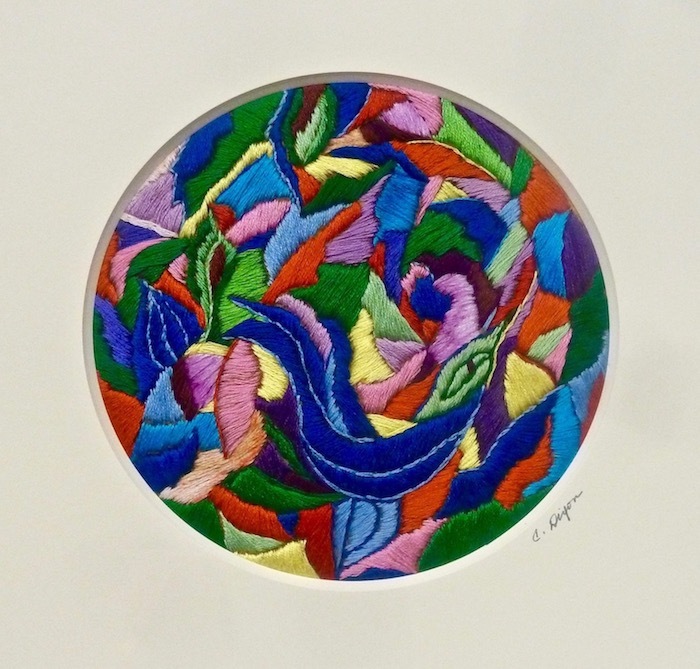 Also, Carol's Mythical Bird (2017, embroidered collage with Caran d'Ache on felt, 13” square framed) was juried into the Greenwich Art Society's “Parallel Visions, Realism and Abstraction,”” running through Aug. 15. Heide Follin has paintings, together with Ellen Schiffman's fiber art, in Organic Explorations, opening at New Canaan Library's H. Pelham Curtis Gallery with a reception Thurs. Aug. 9, 6-8. Q&A with the artists will begin at 6:30pm. At right, Heide’s Passion Flower (2018, acrylic on panel, 13 x 12, click for larger image), is a “visual wandering” of the subject matter in a contemporary way. 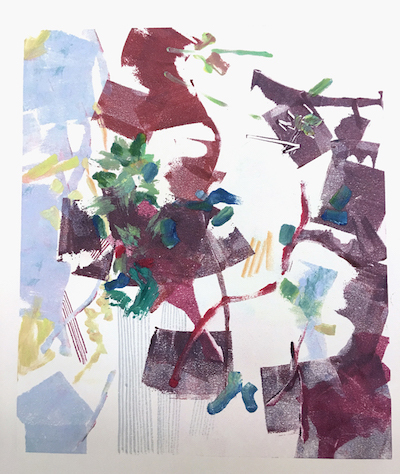 Heide is also contributing her monotype Moving Into Spring (2018, 11x12.75, framed in white 16 x 20) to the ART FOREVER exhibition and silent auction, at 22 Haviland Street Gallery, opening Fri. Aug 3, 5-9pm. This was created with brushes and rollers in a freeform lyrical style. Susan Leggitt was also one of the five artists selected at the Carriage Barn Arts Center's 2017 Annual Member Show to participate in a special group exhibit at New Canaan's Sorelle Gallery: The Carriage Barn Collection. The show will run Aug. 8-24, with a special closing reception Aug. 23, 5-8pm. At right, Susan's Quietude (2018; oil on canvas, 11x17, detail; click for complete image). Susan was also juried into the 61st Mystic Outdoor Art Festival which runs Sat. Aug. 11, 10am-6pm and Sun. Aug. 12, 10am-5pm. Sooo-z Mastropietro is teaching at the Quick Center for the Arts at Fairfield University. First she is running Fashion Design, a sold-out Summer Intensive class for 10-14-year-olds July 30-Aug. 2. Then she is one of three coordinators running Bass Camp, a one-day masterclass on the upright bass in an ensemble setting including a master class with Brian Torff for grades 7-12 on August 27. Julia-Rose had her painting Home is a Feeling (2018, oil on canvas, 30 x 40, detail at right) juried into the Far Away Places exhibition that opens today, Fri., July 27 6-8 pm at the Stamford Art Association and runs through Aug. 23. Julia-Rose comments that the painting was inspired by southwestern landscape, natural elements, and energy over time. 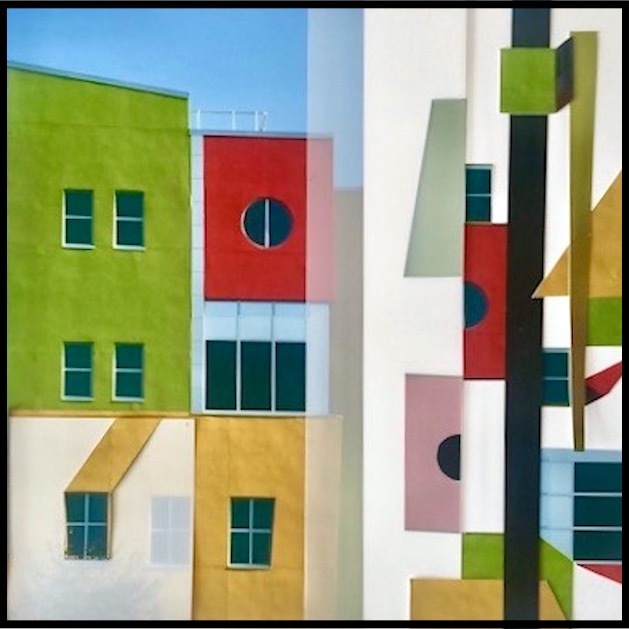 Karen Neems, whose photocollages are being shown in RECONSTRUCTIONS, a 3-person show at the Bruce S. Kershner Gallery, at the Fairfield Public Library, that runs through Sept. 15, will be speaking about her work Sat. July 28 from 5:15pm, at a reception for the show, 4:30-6:30pm) At right is a detail of Karen's Deconstructions (2018, mixed media and photo collage, 24 x 36; click for complete image). This is part of her Deconstructions, series, exploring the synergy resulting from the juxtaposition of a photograph and its deconstructed parts. Amy Oestreicher will be presenting at the Association of Theatre in Higher Education conference (ATHE) in Boston, Aug.1-5, as well as performing an original song, "How Dare You," on the SPEAK NOW Panel Sat. Aug. 4, 8-9:30am. Amy's presentation on creating solo theatre is Friday August 3rd in Boston. 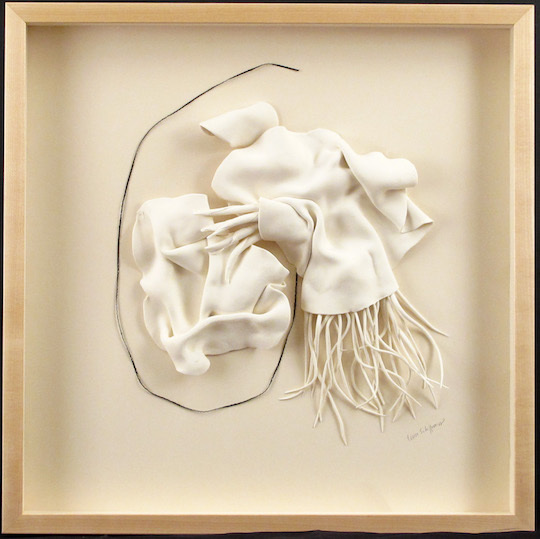 Ellen Schiffman, a mixed media artist whose work often centers on textiles and textile techniques, will be showing some of her recent white work in the two-person show with Heide Follin, Organic Explorations, opening at New Canaan Library's H. Pelham Curtis Gallery with a reception Thurs. Aug. 9, 6-8. Q&A with the artists will begin at 6:30pm. At right, Ellen's Lifeline. Liz Squillace is donating a new Birds on Powerlines screenprint on fabric, in this now classic Paradox Ink series, to the ART FOREVER exhibition and silent auction, at 22 Haviland Street Gallery, opening Fri. Aug 3, 5-9pm. Liz comments that she's keen to help 22 Haviland Street through her donation, as the gallery is such an integral part of the Norwalk & Fairfield County arts scene. Liz has known Dennis Bradbury since they both had studios at the Yale & Towne Lock Factory in Norwalk. At right, details from two other examples from Liz' series. Dmitri Wright was the subject of an article in Greenwich Time that gave an account of his Impressionist Painting workshop at Weir Farm National Historic Site "an intimate en plein air session Wright offers to advanced and professional artists one weekend a month in July, September and October. At 69-years-old, Wright, a longtime Greenwich resident, keeps alive the tradition of American Impressionism, which has roots in town. He was the first artist-in-residence instructing at the Greenwich Historical Society, the birthplace of American Impression-ism; today, at Weir Farm, he expands the legacy of Julian Alden Weir, an original member of the Cos Cob Art Colony who painted Connecticut landscapes. “I’m surrounded by all this, so why not take advantage of it,” he said." See complete article here. In a few days from now, on Tuesday, July 31 5-6:30pm, CT's creative sector will gather for the first ever statewide public gubernatorial candidate forum about arts and culture. The Cultural Alliance of Fairfield County has been working with the Connecticut Arts Alliance and the Alliance for Arts Education while they organize this debate and forum. 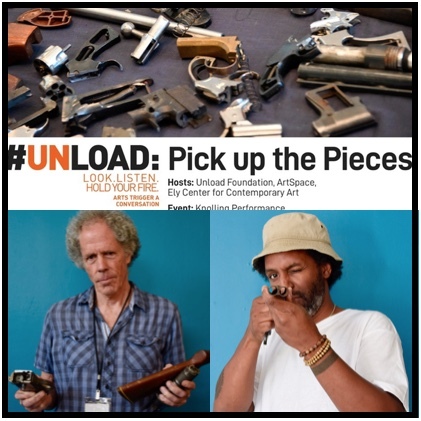 Response has been good - so good that the audience exceeded the first venue’s capacity so it has moved to a larger venue: Cooperative Arts and Humanities High School, 177 College Street, New Haven. We plan to pack that venue too, and show candidates the volume of our unified voice. ● Attend the forum: Your presence matters to demonstrate to the candidates the power of our artists and arts leaders, patrons and supporters. ● Spread the word: Share the Facebook event, and invite people to attend from your Facebook contacts and followers. ● Follow the Arts Alliance on Facebook, and sign up for eblasts here, and follow CAA on Facebook here. ● Vote! Register online. You can also register on the day of the general election, (November 6). Get involved with Create the Vote to ensure that arts and culture are included in the next governor's vision for a strong, equitable, and healthy Connecticut. Military veterans work with youth to paint the city’s Corporal Michael J. Crescenz VA Medical Center. CAN MURALS MAKE A DIFFERENCE? In the latest NEA Arts magazine Paulette Beete looks at how Mural Arts Philadelphia has made a difference in that city. Philadelphia was apparently the birthplace of modern graffiti, with the earliest examples appearing in the 1960s. In 1984, Wilson Goode, Philadelphia’s first African-American mayor, organized a campaign to combat graffiti and hired the young artist Jane Golden, who was smart enough to ask why graffiti was happening and focused on ways to harness that energy into beautifying the city. The program became Mural Arts Philadelphia (MAP) that has now generated thousands of murals and public art from the colorful dreamscape of How to Turn Anything into Something Else (a collaboration between an artist collective and local schoolchildren) to Legacy, partkly completed by incarcerated men using portable materials. "On the sides of restaurants, above community gardens, and in countless parking lots, the murals celebrate Philadelphia’s neighborhoods and the power of community." MAP’s core mission is the same: "Understanding the need for creativity in people’s lives and addressing the city’s more intractable problems through creative means." While public art can make a community more aesthetically appealing, more important is how the process of making art can powerfully give voice to community members. Golden said “We’ve created over 4,000 works of art since 1984. It’s really like holding up a mirror to people and saying, ‘Your life counts.’ We’ve seen people who were engaged in a public art process be impacted in a profound way because they have not been used to seeing their voices count or matter in a public way.” Read the complete article here. Site:Brooklyn Gallery (165 7th Street) is dedicated to exhibiting the current practice of contemporary artists. Site:Brooklyn is accepting entries for its international juried art exhibition, Painting in the 21st Century (September 21, 2018 – October 21, 2018). This is an open call to artists. The exhibition will reflect the ambitious, innovative and contemporary in painting today. The juror is Steven Henry Madoff, an art critic, curator, educator, and poet. He served as executive editor of ARTnews magazine from 1987–1994 and is a contributing editor at Modern Painters and ARTnews. Apply here (through CAFE). Now in it’s 41st year, the New Canaan Society for the Arts announces its Annual Members Show at the New Canaan Carriage Barn. This exhibition celebrates the range, interests, and talents of artist members working across all subjects, styles, and media in art. 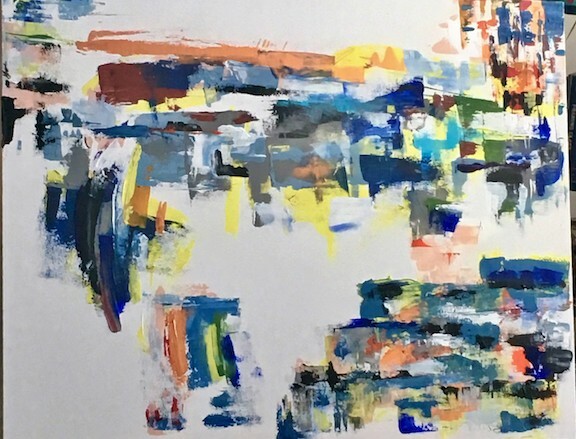 New and current members may enter up to three pieces not previously exhibited at the Carriage Barn; submission fee, $20. One piece will be chosen for inclusion in the exhibition. 2-D works must be limited to no larger than 30″x40″. To enter, membership must be current for the duration of the show through Oct. 13, 2018. Membership is open to anyone with an interest in the artistic activities of the New Canaan Society for the Arts. Deadline: August 18. Apply here. 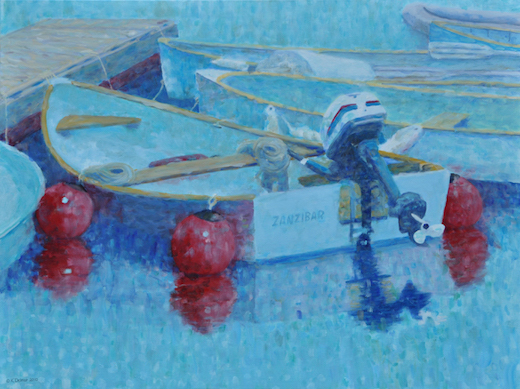 The Rowayton Arts Center has issued an open call to all artists for its Autumn Juried Show. The exhibition will run Sept. 30 – Oct. 27. The juror is Katerina Lanfranco. This exhibition has an open theme and is open to all media: Oil Painting, Acrylic Painting, Watercolor, Mixed Media, Color Photography, Black and White Photography, Sculpture, Printmaking, Pastels and Drawing. Submission fee $25 for 1 and $45 for 2 works (Exhibiting and Supporting Members: $20/1; $35/2). All submissions must be made online. What will be in the show will be determined by the judge based on online entries; prizes will be awarded based on the physical work. Submission Deadline: August 24. Notification of Acceptance by email: September 7, 2018. Receiving Dates for Accepted Work: September 24 (4-7pm) and Tuesday, September 25 (11am-2pm). If accepted, WORK MUST BE HAND DELIVERED. Click here for exhibition requirements. Click here to apply. The Ridgefield Playhouse has announced a call for artists interested in showing their work in the lobby of the Playhouse for its Art, Wine & Jazz performance series. Artwork is displayed in the lobby at a reception before the show, which also includes a wine tasting. Artists can price and sell their work. Artists are mentioned on the website, in press releases and on social media for the show. Good candidates will have strong social media followings, and would be willing to help promote their participation in the event, and the performance event itself. Interested? Then contact Jill Mango at Jill@ridgefieldplayhouse.org. The Ridgefield Playhouse is a non-profit performing arts center located at 80 East Ridge, parallel to Main Street, Ridgefield. The College of Art and Design at Rochester Institute of Technology (RIT; Rochester, NY) invites artists working in moving imagery to submit work for a new, four-screen installation in the atrium of the College’s Gannett Hall on the RIT Campus. The selection committee seeks a compelling, atmospheric work of moving imagery exemplifying a contemporary theme combining at and technology. The chosen work will become part of the permanent collection of RIT’s College of Art and Design and will be awarded $1,000. Artist will grant RIT right to display the work at the sole discretion of RIT’s College of Art and Design. The work will remain on display for an initial debut period, then rotate among other works in the collection. The chosen work will loop continuously on a grid of 4 NEC 4K flat screen monitors mounted in a large display case. A single work can show on all four monitors, or the work can be separated into four separate screens. The preferred format of the video file is .mov or .mp4. There is currently no audio attached to this display – so submissions must not depend on sound. To submit your work for consideration, include a brief synopsis of the proposed work, a public or private (with password) Vimeo, YouTube or other link to the proposed work; and, a current CV (link or attachment). There is no entry fee. The search committee expects to notify all applicants in September 2018. Entry Deadline is August 15, 2018. Founded in 1829, Rochester Institute of Technology, located in Rochester, NY is a privately endowed, coeducational university with nine colleges emphasizing career education and experiential learning. The College of Art and Design houses the schools of Art, American Crafts, Design, Film & Animation, and Photographic Arts & Sciences. Each school offers a variety of programs that focus on individual talent, creative collaboration and cutting-edge technology. Apply here. MOCA Tucson is the pre-eminent, artist-centered contemporary art institution in the Southwest. The Museum cultivates critical dialogue between artists and audiences about today’s world; supports artists through the production and presentation of new, experimental work; and educates the artists and audiences of tomorrow. Artists working in all media and at any stage of their career are welcome to apply for residencies for a minimum of 3 weeks and a maximum of 3 months between October 1 and December 31, 2018, and February 1 through April 30, 2019. The selected artists will each receive a 400 sq. ft. studio and a 400 sq. ft. apartment to create new work at MOCA Tucson with a potential solo presentation of that work. Artists are required to spend a minimum of 25 hours/week working in their studio. Artists will have free WiFi, access to shared bathrooms/kitchens/ library/living space, and access to a shared woodshop/ production space. Artists are encouraged to give a public lecture and/or workshop during the course of the residency for which stipends will be offered. During the course of the residency, we will arrange for curator visits to the artists’ studios. MOCA staff is on-hand to provide technical support and to respond to the studio needs of Artists-in-Residence. MOCA offers live/work studio space, exhibition opportunity, marketing support, and a nominal $1,000 production stipend only. Travel to/from the residency is the responsibility of the artist. MOCA will also produce a short video documenting artists’ experiences/process during the residency that can be used on the artists’ websites. Criteria for Selection: Artists working in all media and at all levels of their career are encouraged to apply. Applications will be judged based on the quality of work samples, statement of purpose, and potential to make the most of their time in the program. A panel of arts professionals and artists will review applications and select artists for fall 2018 and spring 2019. For further details and to apply, click here. The Greenwich Art Society seeks experienced administrative support for its historic art school and artist organization based in Greenwich. Must be proficient in database management, Microsoft office, detail-oriented and thorough, a good multi-tasker, and a great communicator. Must be able to offer congenial customer service, and be enthusiastic about working for a nonprofit and our mission. Must be able to process credit cards for tuition payments, manage student and members' needs, manage class and faculty schedules, accounts receivable and basic accounting. Must be flexible for other office coverage. Permanent schedule: Wed & Fri, 9:30am-3:30pm. Must be able to work 2 weekends in the year to help with annual members' exhibits. Two-week paid annual vacation. Must be dedicated and looking to help grow the organization for the long term. Greenwich or lower Fairfield County resident preferred. Must be able to start training and employment Friday August 10. Please send current resume and three references by August 3 to gasartsociety@optonline.net. The Bruce Museum is seeking new docents to join its team of knowledgeable and friendly volunteers who conduct guided tours of the Museum’s diverse art and science exhibitions and educational programs. “Docents perform an essential task for the Museum, each year leading over 500 tours and programs for groups of adults and schoolchildren and serving as Museum ambassadors to the public,” says Kathleen Holko, Manager of School & Tour Services at the Bruce. “We would not be able to carry out the level of programming we do without them.” An orientation session for new docents is scheduled for Fri. Sept.7, 10am-12pm at the Bruce. This year, the Museum is seeking volunteers specifically interested in working with children and family audiences, who comprise an ever-growing percentage of museum visitors. To request a docent application, click here or contact Kathleen Holko at kholko@brucemuseum.org or 203-413-6741 by August 24. The Wadsworth Atheneum, the oldest continually operating public art museum in the United States, seeks a Fellow of Contemporary Art. This position will provide general support to the Department of Contemporary Art with research and planning for special exhibitions, MATRIX exhibitions, permanent collection installations, and acquisitions and donations. Working closely with the Curator of Contemporary Art, this position will primarily assist with the preparations for two collection-based special exhibitions related to the subjects of queer photography and African American art to be presented consecutively in the summer and fall of 2019. Responsibilities may include: researching individual works of art and artists in the collection as well as potential acquisitions; maintaining and updating exhibition files and checklists to be used by Curatorial, Registration, Museum Design, Public Relations/Marketing, and Education Departments; conduct research on artworks under consideration for loan; coordinate photography and framing of collection and non-collection artworks; create PowerPoint presentations for internal use; assist in the development of texts and labels for the exhibitions. The qualified candidate will also be required to attend and participate in offsite collection, gallery, and studio visits as well as departmental meetings as requested. The Wadsworth Atheneum Museum of Art is an Equal Opportunity Employer.